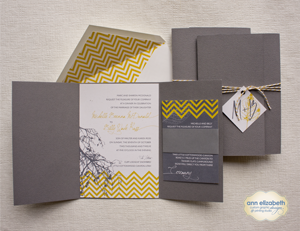 We are so pleased to be sharing Michelle’s invitations with you. Michelle came to us with an awesome pinterest board flushed out with lots of inspiration. As we sat down with Michelle and talked about the items she had gathered for inspiration we were able to get a feel for Michelle’s laid back attitude and easy-going style. 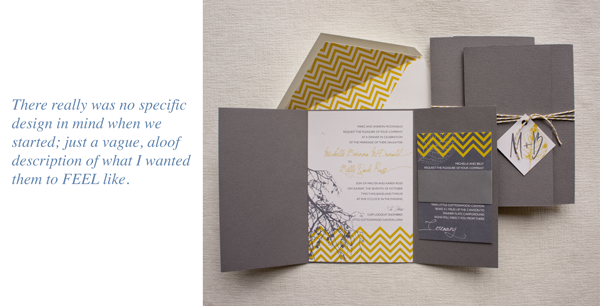 By the end of a very productive consultation the scope of her invitations started to come into focus with a size and shape selected, a color palette nailed down and we figured out the different pieces she would need. Michelle: I was kind of nervous before meeting with Ann Elizabeth because I knew how I wanted the invitations to feel and I was thinking “how am I going to make these guys understand what I want based on a feeling?” I knew I didn’t want rustic and I didn’t want cold. I was also concerned because people can have different ideas of what natural and modern look like and I wasn’t sure how to explain what I envisioned. It was really good to sit down at the consultation and just rap it out. There really was no specific design in mind when we started; just a vague aloof description of what I wanted them to FEEL like. Letting me talk about what I wanted the invitations to feel like and looking at colors and papers led me to those two main ideas. For all of our pinterest fans, here’s your pinnable.